Do you have a pet cat? We do, his name is Othello, and he is 13 years old. He is a very messy cat who always tracks kitty litter on the floor outside of his litter box – like two to three times per day. So I usually spend a few minutes each day/week sweeping up cat litter, so he doesn’t track it all over the house. Unfortunately, after reading this post, you and I will still have to sweep up kitty litter, but maybe a little less often with the UP Kitty Litter Catcher idea. Solution: Create a platform with holes to catch the litter & bits (like a screen). You can remove the top and discard what’s trapped below. This will reduce the amount of debris that you have to clean up. How to get one: Real talk – you got to make it yourself, fool! These are just ideas, Jack! You think I’m going to “try” (See that’s the operative word, because you know the Jokers at Bank of America ain’t going to give a brother no money to finance his dreams) to get a small business loan and take out a second mortgage on my house (Again, this too might be difficult because them Jokers at Quicken Loans be trippin’ for reals – so I’d have to run up all my credit cards, and then, get a couple of “side hustles” to pay off my credit card bills… How I look as an Uber driver in a parking lot slangin’ a cat accessory out of the back of my trunk? You want that Garfield Yo? I got that Sylvester Man! You need to get this Ren and Stimpy homie!) to create a “specimen”, then get a utility patent, create a marketing strategy and trademark, invest in a 3D printer to make a working model, fly over to China to get it manufactured, spend 12 hours a day in my non-insulated garage assembling boxes and point of sale kits, and spend months trying to get on the shelves at Petco and Walmart, then work to sell them online and at local swap meets and flea markets, while trying to raise funds via Kickstarter, and then go on Shark Tank and have that bald Joker tell me that I’m an idiot for wasting my time and money on a product that does not have a set market or target demographic, and then after I show them a picture of my toothless cat, he changes his mind (because he has a soft spot for animals) and offers me an insane deal in “perpetuity” in which he owns 99% of my company and makes $0.99 on the dollar for the first 10,000 sales, and re-names the product Mr. Wonderful’s Kitty Litter Catcher, and because I’m in debt up to my eyeballs, I cry like a baby on national TV and gladly take the deal (While the other Sharks shake their heads in utter dismay and think, “Would you look this <adjective> here?“), then someone (who saw the TV show) steals the idea, changes it up bit, and makes millions off of it, and because I can’t afford a lawyer, I can’t sue them, and my “Shark” sends me an email that reads, “You’re dead to me”? Guess again my friend, au contraire mon frère, no way Jose, sssssshhhhhhhhhiiiiiiiiiittttt! I’ve got a pretty nice broom (you know the kind with the angled bristles, ergonomic handle, and the clip on dust pan?). 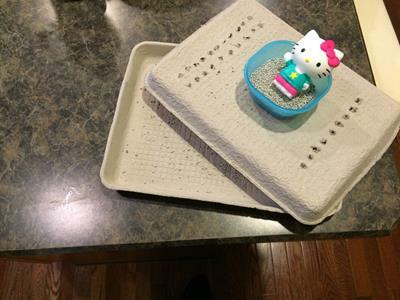 But I do plan on building a plywood version of the UP Kitty Litter Catcher this summer! Stay tuned for an update.